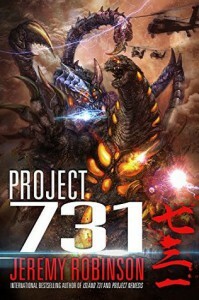 ABR's full Project 731: A Kaiju Thriller audiobook review and many others can be found at Audiobook Reviewer. The start of this book picks up with references to “Island 731, Project Nemesis, and Project Maigo” . The “Darwin” is a research ship that was looking for it’s missing sister ship “Magellan.” The location was the huge garbage dump in the Pacific ocean. It is also close to where Island 731 used to be. The ship appears to be deserted. A team of Black Ops is approaching with orders to board and search the ship. They do and they find what they were expected to find. One of them will die to bring back a sample of “Black Matter”. I have finished “Island 731″ and it was an extremely good read. Evan though I have not read the next two books I can figure out what happened and want to read them also. The characters are so well developed that you just know it will be a fantastic story. The plot is still the monsters from the earlier books but now Jon Hudson and Mark Hawkins have so much more to fight for. The depth of their feelings for the people they are protecting is obvious. Jon and his crew are training Lilly, the chimera cat-girl that he rescued from Island 731. They also have another girl, Maigo, the teenage girl who once was part of Nemesis. Jon is also getting really serious about his girlfriend Ashley Collins. I can’t get enough of the technology that Robinson has come up with. The fly suits are a reality but in this time they have improved tremendously. Other weapons are also improved and the armor the “bad” guys have is incredible. Along with all this is the plane. But the best part of any monster thriller is the monsters and these have reached a whole new level. I know there will be more of this series coming in the future. Can’t wait to find out what Robinson comes up with next. I have the audio version of the book read by Jeffery Kafer. (Hope I got his name right.) He is super at this type of book. He has a great voice. Not to deep or too high. Bringing the story to life he takes the listener to the front of the action. Audio production was perfect. No problem with static, skips, or breaks. A perfect recording.